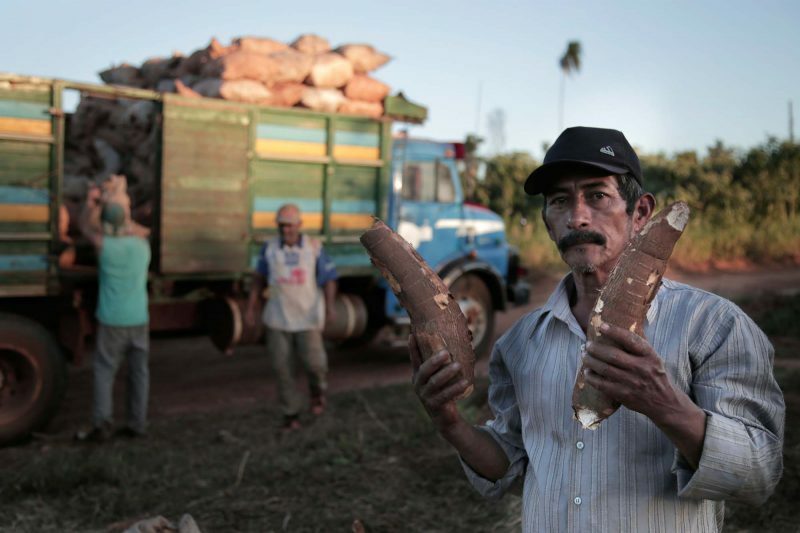 In Paraguay alone, between 700 or 800 varieties of mandioca (also called yuca or cassava) are grown on 445,000 acres, yielding 6 million tons of the staple crop. Photo by Juana Barreto. Used with permission. 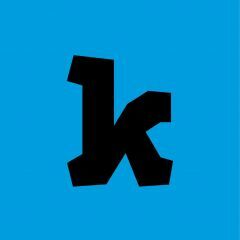 This post is an abridged version of a story produced by Kurtural and published on Global Voices with the author’s permission. It is part of the series “The landless don’t go to the supermarket,” which will be published and re-edited by Global Voices. Before dawn, Severiano Ruiz Díaz detonates an explosive firework beside his house, but his children slept right through the blast. Throughout the rest of the community of Primero de Marzo, Ruiz Díaz’s neighbors wait, listening for a second explosion that would signal the presence of police. But today, there is no second blast, and a new day begins for the 300-plus families in Primero de Marzo, a community where food is plentiful in a hungry nation. Primero De Marzo is an asentamiento or informal settlement, one of at least 200 similar communities established by landless farmers in Paraguay. It has three schools, no church, and nearly 2,500 acres of rich red soil. The settlement of smallholder farmers is surrounded by soy fields, engulfed by mechanized farming in a country that is the world’s fourth largest exporter of the crop. But in an effort to encourage family agriculture, Primero de Marzo prohibits cultivating soy within its territory. Instead, the community sustains itself through a diverse array of crops. 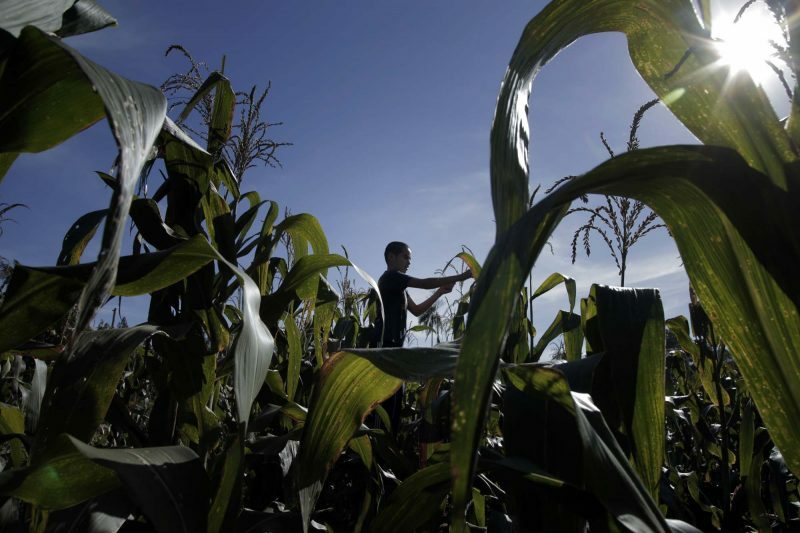 Paraguay’s small farmers face many obstacles. In Primero de Marzo, those include the lack of roads and competition from contraband produce smuggled in from abroad. Photo by Juana Barreto. Used with permission. Their small fields are the the last plots of land in the county where food crops — not commodities — are grown. They harvest two kinds of bananas, three varieties of corn, four types beans, sugar cane, yerba mate, peanuts, papaya, sweet potatoes, watermelon and cassava. Each member of the settlement is assigned at most 25 acres of land, which totals a little less than half of the 4,000-plus hectares of land whose ownership in disputed by the residents, the Paraguayan government, and a group of powerful landowners — the Bendlin Family. During the long-running dictatorship of Alfredo Stroessner, the Bendlin family illegally traded an airplane for the land where Primero de Marzo now stands, an airplane that does not exist in the country’s official aeronautical records. The family are the Paraguayan representatives of a famous German vehicle brand; have relations with Paraguay’s president, Horacio Cartes; and own a lot of real estate in Paraguay’s largest city and capital, Asunción. The Bendlins were accused of hiring thugs who harassed Primero de Marzo for years and who, on June 11, 2014, attempted to kill Severiano Ruiz Díaz. But bullets aren’t the community’s only problem. Police have officially evicted the community from their lands on three occasions, burning houses, destroying crops and confiscating or killing livestock. Government officials have charged members of the community with crimes of occupying land and accused them of criminal association. In contrast, the attack on Severiano Ruiz Díaz and instances of police violence during the evictions have not been investigated. Activities in Primero de Marzo begin early and include the whole family. Photo by Juana Barreto. Used with permission. Severiano Ruiz Díaz speaks about the evictions while finishing breakfast in the hallway of his family’s wooden home. It’s the second house he’s built here, just five meters from the first house that police burned to the ground. The new building is small, but has basic amenities like electricity, thanks to the 14 miles of power lines the community installed themselves to serve all the families in Primero de Marzo. For rural farmers, the right to land transcends purely economical considerations: It is the right to a domain, the right to exist. But it is a right enjoyed by few in Paraguay. About 94 percent of the nation’s arable land is farmed using mechanized agricultural techniques to produce commodities for export, including soy, corn and wheat. Conventional agribusiness requires only one employee for roughly every 500 acres, or 40 times fewer jobs than the style of smallholder agriculture practiced in Primero de Marzo — the kind of agriculture that got Severiano Ruiz Díaz shot. Paraguay faces extreme inequality in land ownership, according to the Gini Index, which measures the extent to which incomes deviate from perfectly equal distribution. Fifteen landowners in Paraguay together hold property twice the size of Puerto Rico, while more than 300,000 Paraguayan families own no land at all. Every June, the colors of harvest fill Primero de Marzo. Along the crooked path worn by tractors and motorcycles, you can see fields of corn, banana and towering manioca rocking in a winter breeze. These are days of “halfway peace” say the residents. 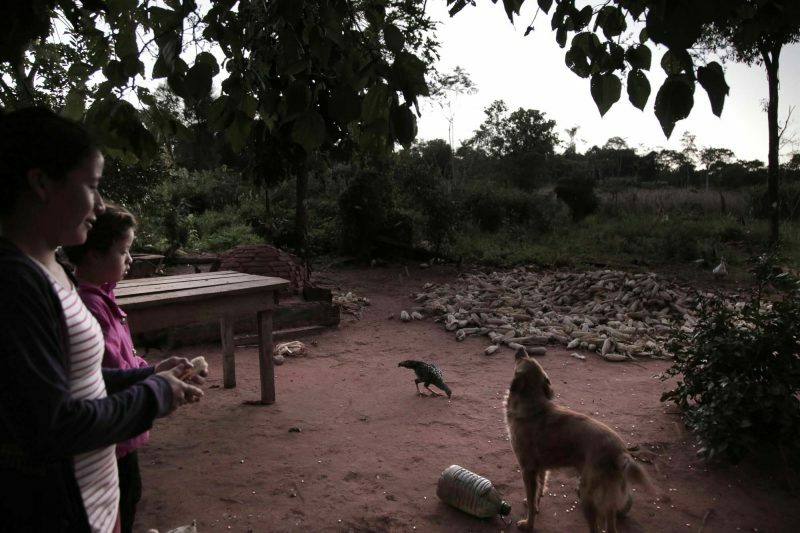 The community’s agricultural abundance stands in contrast to the violence it has endured, and to the reality of the entire country: Every day, 700,000 Paraguayans face hunger. None of them lives in Primero de Marzo. Nonetheless, the farmers of Primero de Marzo struggle to sell their products to a hungry nation. The problem begins with transporting their harvest: inadequate roads and exploitative middlemen. Then — even if products reach Paraguay’s main produce market, Mercado Abasto — they must compete against the prices of contraband produce, much of which comes from Argentina. Although the Paraguayan government is committed to supporting smallholder agriculture in theory, between 2013 and 2016 the importation of fruits and vegetables to Paraguay doubled. Between 2003 and 2013, the number of acres dedicated to growing tomatoes, a staple of Paraguayan cuisine, was halved. This loss of production and diminishment of Paraguay’s food sovereignty has resulted in recurring periods where tomatoes cost more than five times their usual price in Asuncion. 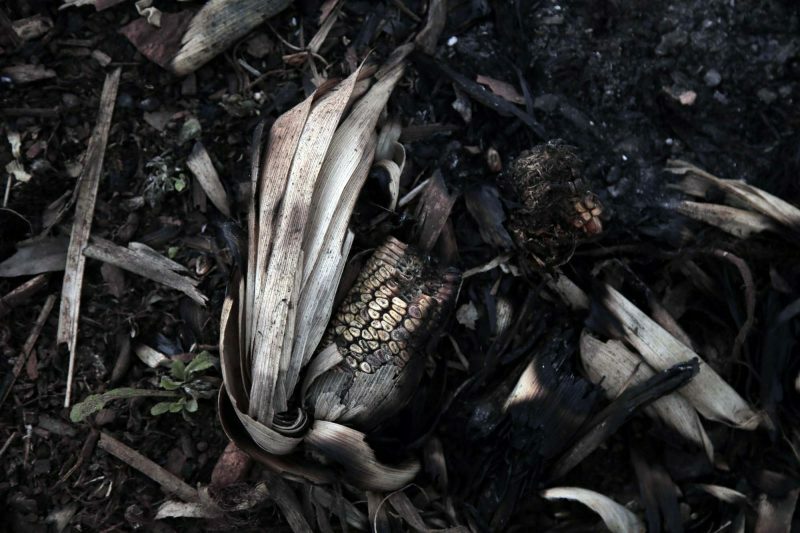 Farmers in Primero de Marzo grow three kinds of corn: white, tupí, and chipá, but famers complain that they have no market for their harvest. Photo by Juana Barreto. Used with permission. The families in the settlement still inhabit a territory of uncertainty. But while their land remains in dispute, a second generation is growing up in Primero de Marzo, a generation that has inhabited these lands since birth. A generation of children that run and laugh and splash in mud puddles and go to school. Who, like Ruiz Díaz’s children, hope that lunch will be chicken stew. And while these children grow, the community of Primero de Marzo keeps waiting, each morning, for a second explosion.